Our space is perfect for your next event. Email our Administrator to set up a time to view our spaces and reserve the one that works for you: ThroopChurchUU@gmail.com. 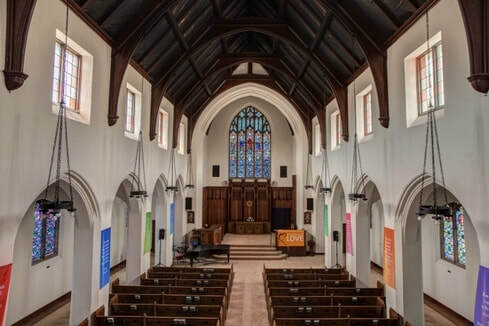 If you're looking for a beautiful and picturesque place to be married - a location with all the charm of classic churches and the open attitude of the modern world - then you'll find what you're looking for at Throop Church. 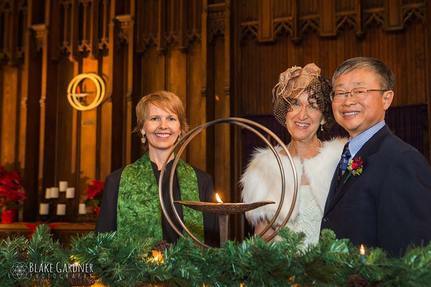 As a Unitarian Universalist congregation, we welcome marriages that span the widest spectrum of the human heart, regardless of race, religious affiliation, or sexual orientation. This is a home for everyone - including you and your partner - and we welcome you to Throop. From the soaring arches to the high-beamed ceiling, from the powerful and awe-inspiring stained glass windows, to the long wooden pews and carved pulpit, you'll find a classic look that's the perfect backdrop for your ceremony and photographs. 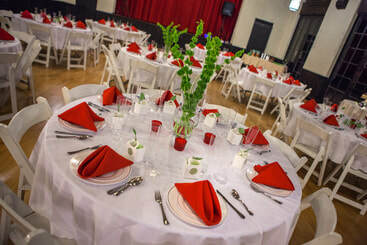 Throop has a full industrial-level kitchen that caterers praise, a full reception hall that seats up to 120 for dining and can double as a dance floor with a full proscenium stage, and a patio adjacent to the hall for outdoor affairs. Throop Hall set up for a celebratory reception, including a full-size stage complete with flood lights. We offer Patio and Sanctuary ceremonies at Throop. Patio wedding: provides up to 2 hours for an outdoor ceremony with up to 35 guests for $400. 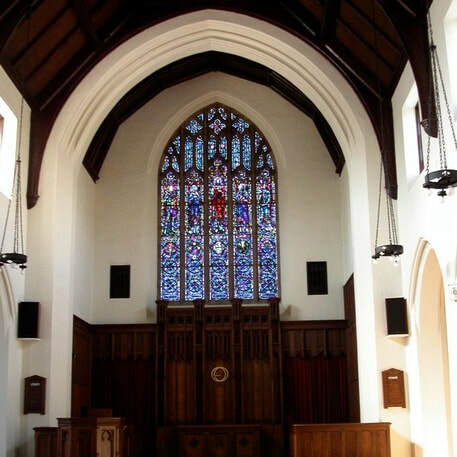 Small wedding: provides up to 2 hours for a ceremony in our beautiful sanctuary with up to 75 guests for $800. 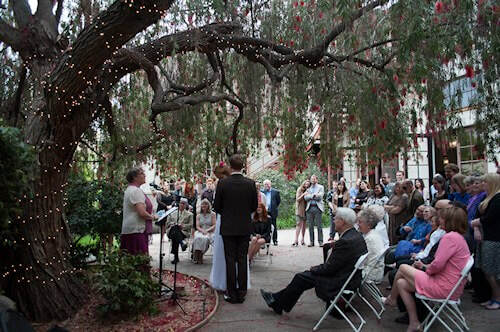 Medium wedding: provides up to 4 hours for a ceremony in our beautiful sanctuary with up to 225 guests for $1000. In addition to the sanctuary, we also have a separate reception hall. Throop Hall. Our reception hall has maple floors, high ceilings, plenty of light and historic charm. There's even a proscenium stage. And the reception hall is right next to our commercial kitchen. Three sets of double-glass doors lead from the reception hall to our charming outdoor patio. We offer two reception packages at Throop: intimate and full. Our intimate wedding reception provides 3 hours for a small gathering in Throop Hall for $400. Our full reception provides 8 hours for a larger gathering in Throop Hall. Throop Hall can be arranged with or without a small dance space on the hardwood floor. We can provide tables and chairs depending on the number of guests. The full reception price is $1200. ​Email or call our Administrator to set up a time to view our spaces and reserve the one that works for you: ThroopChurchUU@gmail.com. 626-795-8625.